You will find this Muay Thai camp is the perfect place to recharge and get fit. 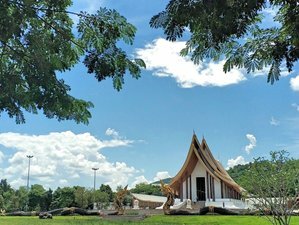 Set in pretty farmland, among rice fields in the beautiful province of Phetchabun, they offer daily meditation, yoga classes, Muay Thai training and much more. You will be living with a lovely Thai family on their property surrounded by banana, mango, and coconut trees. Submerge yourself in Thai culture and family friendship. Looking forward to welcoming you to this rural retreat. Unique countryside location away from tourists set in the heart of Thailand. Explore the majestic Phetchabun hills. Hike with our Monk to the top of Coral Mountain and take in the stunning views. You’ll start with the “Raw Fest” (optional may not be suitable for all guests.) This allows the colon to rest by removing a complex diet and providing natural energy and vitamins from raw foods. After five days your body will be ready to start enjoying some of the finest fresh Thai food packed with heaps of nutrition. To help you reset, Battle Conquer has included all of the sightseeing tours in this package (go to Included Excursions for more information.) There are hikes that take you to breathtaking views, Thai massage treatments to help you unwind and you train against a backdrop of lush farmland. Meeting the English speaking Monk is a very spiritual experience. You will be able to ask him many questions as well as sit and meditate with him. Afterwards you will take a hike with him along the rocking maze or stone steps at Coral Mountain. The drive to the monastery takes you through the beautiful Phetchabun Hills, the scenery around the monastery is extremely pretty and the views at the top of the hike are breathtaking. Everyone looks forward to the Sunday rest day! There are many beautiful places to visit in Phetchabun so on Sunday, they take you to their favourites. It could be the stunning Nong Pye Lake, one of Phetchabun's largest set deep in the valley with beautiful panoramic views, take a raft out and relax, swim, fish, if you’d like refreshments, it’s not a problem, simply wave a flag and you can order the most delicious food and drinks delivered to your raft. Sapailo Temple is another lovely location for a trip out with its pretty gardens and caves to explore or they may take you to the hot spring baths. Every Thursday and Friday, they have a meditation practice at the temple or lake. On Friday evenings, you can tour the vibrant night markets. They can also arrange fishing in the local ponds. There is a lot to see and do, so please ask if you want to see something specific that's not listed here and they will see what they can do to help. There are so many amazing experiences to be had there from visiting temples and meditating with monks to taking out a raft on the largest lake to fully kicking back and relaxing.